Friedberg 202a (W-2600). 1861 $50 Interest Bearing Note. PCGS Currency Very Fine 25.This extremely important offering represents the only issued example of the entire series of 1861 Interest Bearing Notes remaining in private hands. This is one of Joel Andersons favorite notes among his many treasures. 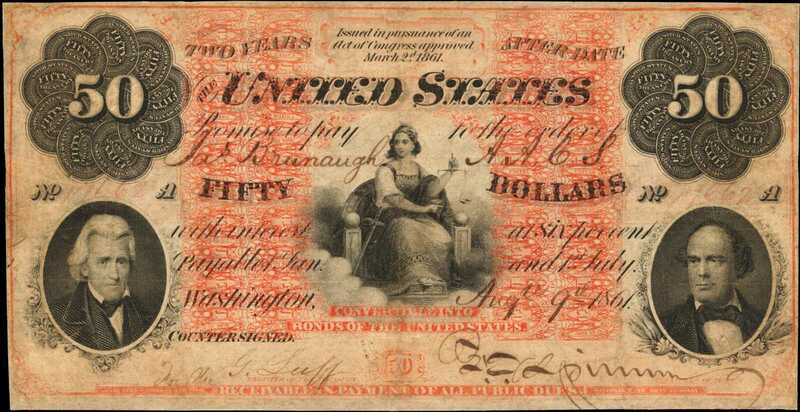 The series was issued under an Act of Congress passed March 2nd, 1861, which provided for $10 million to be issued in the form of bonds or, if bonds could not be sold, circulating Interest Bearing Notes in denominations of no less than $50 that bore interest at a rate of 6% per annum. With Civil War looming and no market support for bonds, Interest Bearing Notes in denominations of $50, $100, $500 and $1000 were issued. They were produced by the National Bank Note Company using a process, the "cycloidal configurations." The patent for this was issued to James MacDonough on April 23rd, 1860. National used this distinctive style on many notes of state-chartered banks as well as the series of $50 to $1000 notes produced in early 1861 for the CSA. A total of 46,076 examples of the presently-offered federal $50 denomination were issued.<p>The $50 notes depict Justice seated with sword and scales at center. At lower left is the portrait of Andrew Jackson, engraved by Charles Burt; ironically the same portrait used on the $1000 Montgomery-issued notes of the Confederate States of America, also printed in early 1861 in New York City by the National Bank Note Company. <p>To the right is the portrait of Salmon Chase. To the upper left and right are counters with the denomination 50 at the center, and overlapping petals around, the cycloidal configurations (sometimes called a kaleidograph counter in Treasury records), each with "UNITED STATES / FIFTY / TREASURY." In the lower left signature panel is the signature of Treasury Clerk G. Luff whose handwritten "for the" appears before REGISTER OF THE TREASURY. United States Treasurer Francis E. Spinner, never one to turn down the opportunity to use his grand signature has signed the note in the lower right. The back is printed in blue in the cycloidal configurations format, with "Pay to Bearer" vertically at the center, below which is a space in which the holder of the note could sign. "NATIONAL BANK NOTE COMPANY" and its 1860 cycloidal configurations patent date are printed vertically to each side of the center. Related configurations were used by National on many notes issued by state-chartered banks. About 19.5 cm wide by 10 cm high.<p><p>The printed design elements of this extraordinary note are nicely printed in striking detail. The manuscript details are well penned and still bold even almost exactly 157 years after the note was issued. Restorations are mentioned by the grading service on the back of the holder. Upon close inspection they can be found primarily at the edges and along the bottom portion of the fold in the center of the note. Overall, all of the important details of the note are fully legible and the note is very appealing for the assigned grade. Most importantly the note is free of any cancellations.<p>This is the only collectible issued note in existence for the entire 1861 issuance of Interest Bearing Notes. One other example of the $50 denomination, a redeemed and cancelled note, resides in the Bureau of Public Debt in Washington D.C. The only other notes known for this series are found in Proof or Specimen form. In three previous auction appearances this note has traded hands for $10,000 (August 1970 Rarcoa sale), $605,000 (May 2001 CAA sale) and $368,000 (February 2005 Heritage Sale). This offering represents a great opportunity to obtain a note for which no equal is available. <p><strong>Interest Bearing Notes of 1861</strong><p>Bills of this authorization and denomination bore interest at the rate of 6% per annum for two years, reflecting that the credit of the Union stood higher than that of the newly formed Confederacy, which paid 8% on its notes. At the time of issue the circulating notes were sold at a discount from face value to reflect the interest to be earned for two years. At the end of this period, nearly all were redeemed. Most holders of these notes were banks; they did not circulate in general commerce. As can be said for the Montgomery Notes, printed in New York by the National Bank Note Company and issued in precisely the same denominations, the Interest Bearing federal notes can also be considered bonds. Indeed, they were widely advertised as such by Jay Cooke & Co.<p>From Rarcoas sale of August 1970, lot 1709; Currency Auctions of Americas sale of May 2001; Heritage Auctions sale of February 2005, lot 16753.